Semichem customers in North Lanarkshire are being encouraged to donate gifts purchased in-store to the Give a Festive Gift appeal, to assist local families struggling to afford presents for teenage children in the run-up to Christmas. 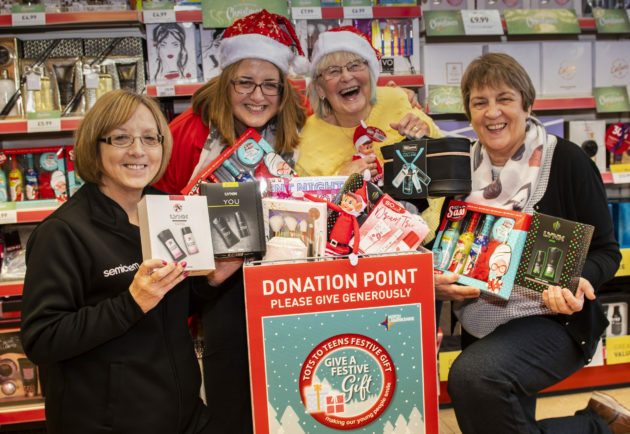 The stores in Wishaw, Motherwell, Carluke, Airdrie, Coatbridge and Hamilton have set up donation points where customers can give presents such as make-up sets, toiletries and hair products. North Lanarkshire Council has teamed up with local voluntary and community organisations, to organise a nine-stop giveaway tour across the region to assist families who find the festive period challenging, after the appeal helped around 600 families and 1500 children last year. A community organisation instrumental in the appeal has been ‘Toys and Games Giveaway’, which was set up by volunteer, Martine Nolan, who started the campaign in the North Lanarkshire area three years ago with the aim of providing 400 families, who are struggling financially, with much-needed Christmas presents. While that campaign still continues to flourish, Martine also recognised that older siblings in these families were often forgotten about with cuddly toys unsuitable gifts for teenagers. So this latest initiative in partnership with health and beauty discount store Semichem, who also donated £500 of vouchers towards funding presents, was launched in the middle of November and will run for three weeks with customers invited to buy a gift and then donate it. Community volunteer Martine said: “Thanks to Semichem for the donation of vouchers and for also providing us with the collection points with all their stores in North Lanarkshire – it has helped bring this idea to life. “The Toys and Games Giveaway campaign has grown massively over the past few years and the difference we’ve been able to make to hundreds of families in the area has been absolutely amazing. “But we noticed that the donated gifts we received weren’t always right for the teenagers, who have grown out of playing with toys and want something different. “This initiative has been named the “Give a Festive Gift Appeal” and has been activated in partnership with North Lanarkshire Council to support tots to teens. 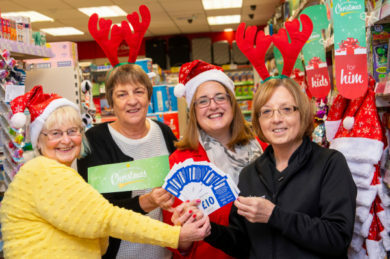 Scotmid Co-operative owns the Semichem brand and Board Member Kaye Harmon added: “This is a fantastic cause that we are very passionate about supporting – Martine and her team have a done an incredible job making a positive difference to local families at Christmas time. Top Image Caption (left to right): Semichem Wishaw store manager Tricia Dunne, Toys and Games Giveaway founder Martine Nolan, Toys and Games Giveaway Board member Fiona Johnston, and Scotmid Co-operative Board Member Kaye Harmon launch the Give a Festive Gift Appeal initiative in the store on Main Street, Wishaw. Below Image: Semichem store manager Tricia Dunne and Scotmid Board Member Kaye Harmon present the £500 of Semichem vouchers to the Toys and Games Giveaway team in order to buy gifts for teenagers this Christmas.